Spring seems to be having growing pains. Only ten days ago I was sitting outside in warm sunshine and now that feels like another year altogether; its so cold I feel it in my bones. The wind whips across the valley and lashes freezing rain against windows and doors. Occasionally clouds get driven apart by the wind, and the sun briefly pans across the hillside. 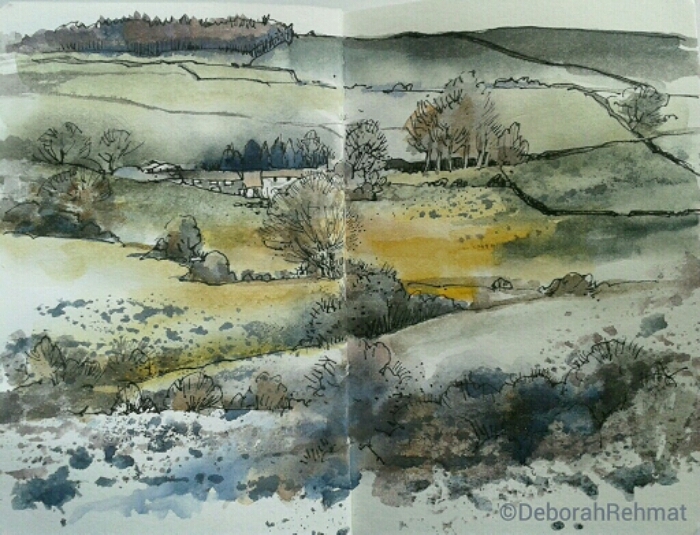 One afternoon this week I sketched from the window and tried to catch the sunlight as it as it ran along the fields. It’s futile; I can never do it, but watching it is irresistible.